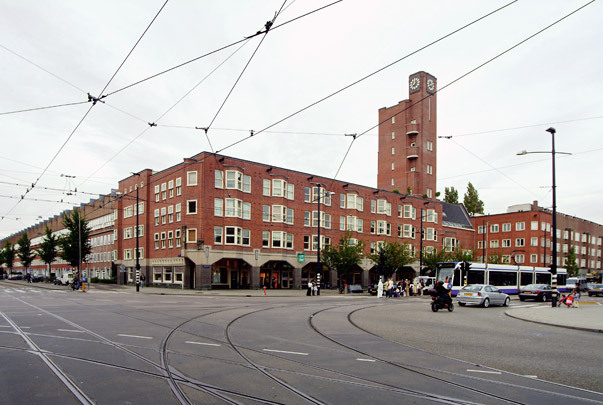 Berlage's urban layout for Mercatorplein in Plan West is ranged round a so-called turbine square; the main road (Hoofdweg) was split into two, studiously modelled with gateway buildings and accentuated with two towers. Though the housing frontage pays passing homage to the sculptural architecture of the Amsterdam School, what predominates is the massiveness of the square's walls, portals and almost medieval towers. A comprehensive renovation plan involved redesigning the square and rebuilding the second tower, which had been demolished in 1961.